When I taught cooking, I always asked my students who made stock. Everyone just laughed. No one has time for something as archaic as that. Problem is, without homemade stock, cooking suffers. It wimps out. It lacks foundation and flounders. Food made with that imposter, commercial so-called stock (sorry Knorr) tastes completely mediocre or as the Chinese say mama huhu. Who wants mama huhu cooking when every mouthful has the potential to sing out with flavour? What’s the use of boring risotto or lackluster soup? There’s no excuse! Homemade stock is a must-do and a must-have. All you need is a bunch of bones, a big stockpot and time to let it simmer. That’s why I was so happy when shopping at Whitehouse Meats at the St. Lawrence Market this weekend. I asked for some chicken bones and was given two bulging bags of frozen chicken bones gratis. While Whitehouse specializes in a lot of exotica – from elk to ostrich to de-boned quail – they don’t carry chicken feet. I had to go to Fu Yao Supermarket on Gerrard St. (near Broadview) for those. Besides, who wants to miss the experience of reaching into a smelly bin with a plastic bag over your hand and grabbing a few pounds of feet: they’re slippery and leathery at the same time, with lots of wayward appendages. Fun. Rinse the bones. (Sometimes they’re bloody. Enough said.) 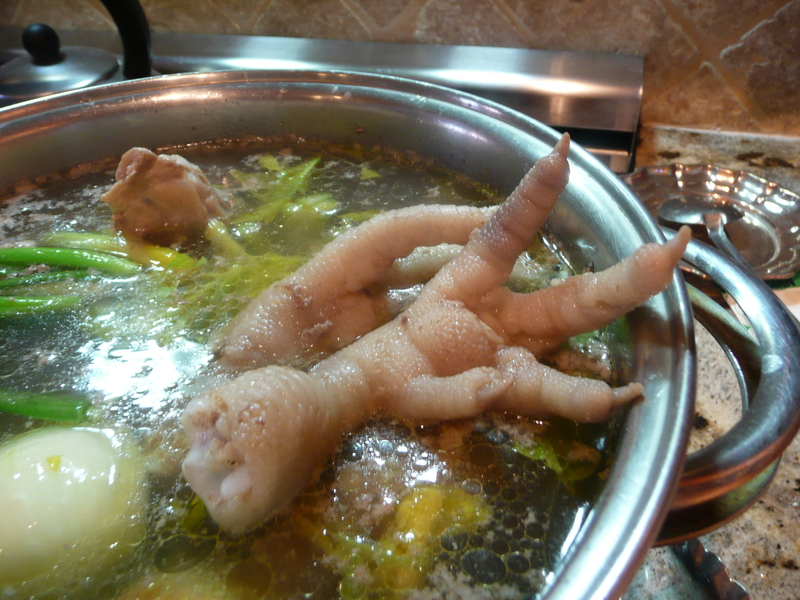 You’ll need at least 4 lbs of chicken bones and/or chicken feet to fill a large stockpot. Fill with enough water to cover the bones and turn the heat to high. As soon as you see the first bubble, crank the heat down to low. The goal is to simmer, not bubble like mad. Boiling stirs things up and creates a cloudy, messy stock. We don’t want that. Once the simmer begins, slime starts to surface. Skim it all away. I like to spoon it out and place it in a fine-mesh sieve over a bowl. I return the liquid that collects in the bowl back to the stock. Add flavour. I add 3-4 quarter-size pieces of peeled ginger, 3 whole crushed garlic, a cooking onion sliced in half, 2-3 stalks of celery (count yourself lucky if you have celery leaves, they add great flavour) and 2 green onions, chopped into thirds. I cook it covered, on the lowest of lows for 3-6 hours. Strain the bones from the liquid and once it has cooled, transfer to freezer containers (I like to use yogurt containers, which hold about 3 cups). Refrigerate overnight. Skim off the fat. Freeze. This entry was posted in Chicken stock, DIY, Recipes, soup and tagged broth, chicken broth, easy chicken stock, make stock, slow cooking. Bookmark the permalink. Here’s nice tip: leave the skins on your red and yellow (spanish, vidalia) onions when you add them to your stock. It makes for a richer more vibrant colouring for the stock and tastes great. Like that tip. Makes ’em easier to strain, too. And if there is an onion hater in the house, you can sneak them into your Sunday sugo that way, too, right? I will try your stock tips next time Madeleine. Mine always turns out really bland! Thanks. Good stock needs time. Plan on cooking it slow and long for at least 3 hours. To save time I make my stock in a pressure cooker – 40 minutes and you are done and the flavour is intense! What brand do you recommend? I’ve always been a little timid around pressure cookers due to an often told family food story. Shortly after my parents got married, my Mom cooked one of her first meals for my Dad, pulled out her brand new pressure cooker, gave it a test whirl and had a huge spinach explosion. She spent days cleaning the walls and has never been too fond of eating her greens, since!